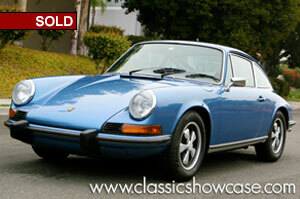 Classic Showcase has just recently completed a Show/Driver level restoration to this numbers-matching 911T. This Porsche was built in December of 1972, and has held exclusive long term Californian ownership for its entire life. It was initially sold new from a dealership in San Jose, CA in 1973, lightly driven in the following 2 decades, then put in long term storage from 1993 to the mid-2010s. 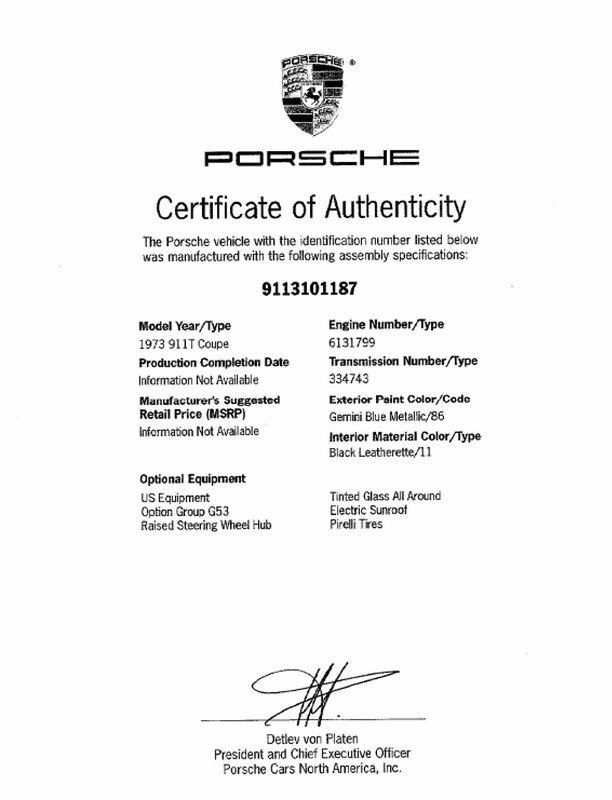 The car was then rediscovered in 2014 by a Northern California Porsche enthusiast who found the car at a garage in Pacific Grove, CA complete with its original Blue plates. The enthusiast got the car back on the road with routine service and maintenance before Classic Showcase acquired the example in 2015, starting the restoration work in the Spring of 2016. Our team began the project by completely disassembling the car, which included the engine, interior and body trim, glass, and more. The car was then stripped to bare metal, metal finished, then painted in its original color of Gemini Blue, with the upholstery retrimmed in its original black interior colors using correct and proper materials. The sunroof was restored as well, along with the addition of a new headliner on the 911T’s interior. The car’s instruments were thoroughly cleaned and serviced, and all mechanical systems were brought up to specifications; a new battery was installed, along with new heat exchangers, new clutch and brake components, and the engine was put back to its original colors and all new rubber was installed throughout the car. The Porsche’s original Fuchs wheels were fully restored, and new trim and other Porsche-specific items were purchased and installed, and the car also includes a fully functional Alpine stereo system with new speakers and antennae installed. This 911T is sure to make a great choice for the eager Porsche collector looking for a restored example worthy of a drive along their favorite route, showing at events, or simply as a prudent Blue Chip investment. Receipts of the previous service work, as well as a DVD of the restoration work performed by Classic Showcase accompany the car. Building on the success of the 2.2-liter engine, Porsche bumped the 911's six to 2.3 liters (actually 2,341 cubic centimeters, which Porsche badged as a "2.4") for 1972 by bumping the stroke up to 70.4 millimeters from 66 millimeters while keeping the bore at 84 millimeters. This pushed output of the 911T engine (now with Bosch fuel injection) to 157 horsepower, the 911E to 185 horsepower and the 911S to a potent 210 horsepower. The new power led Porsche to install a new, stronger five-speed transaxle and a new, more robust version of the still ludicrous Sportomatic. Except for a small chin spoiler on the 911S (offered as an option on the other two models) and the "2.4" badge on the deck lid's air intake, the '72 911s were visually almost indistinguishable from the '71s. Porsche applied the name "Carrera" to the 911 for the first time during the 1973 model year. The RS Carrera was a homologation special for racing and as such featured more radically flared fenders, larger (185/70VR15 front and 215/60VR15 rear) tires on appropriate wheels, a big 2.7-liter version of the 911 engine (achieved by blowing the bore up to 90 millimeters) making 200 "net" (more conservative than "gross") horsepower and, of course, the classic ducktail rear spoiler. Not surprisingly, this lightweight car was too good to sell in the United States, but 1,800 were built for the rest of the world. Meanwhile, over here, the '73 911s had their "2.4" engines also rerated using net figures to 135 horsepower for the 911T, 159 horsepower for the 911E and 181 horsepower for the 911S. Otherwise, if you could perceive a difference between them and the '72s, you were a Porsche fanatic of the highest order. Midway through the year, Bosch electronic fuel injection replaced the mechanical unit on the 911T and that engine was rated down a single pony to 134 horsepower, but drivability soared.